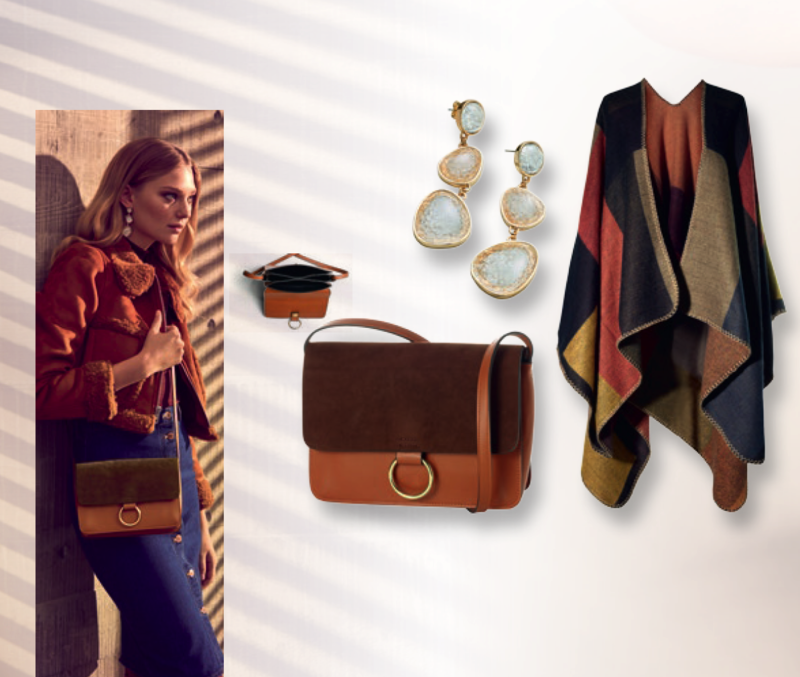 Escape to normal and launch yourself into a stylish style, dominated by autumnal tones, rich textiles and exquisite finishes from the Oriflame Country Collection. A field look – One of the trends in materials this fall will be the suede. Aveludads bag and warm color ponchos will look great tights or a colorful skirt and light shirt. Golden details are essential. After all, what would cowboys lack of gold? 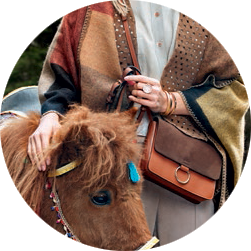 Elegant saddle bag in textured skin in beautiful cognac tones with a trendy suede imitation brim highlighted with gold accents. Interior: Magnetic closure, 3 compartments with black polyester lining – 1 of them with zip closing. Contrast stitching and adjustable handle. Dimensions: 22.3 x 5.5 x 16.5 cm. Magnificent Jacquard poncho, with a unique pattern, in a palette of autumnal tones. With soft acrylic and polyester threads, it’s warm and light at the same time. Debrum manually set. Unique size. Dimensions: 150 x 130 cm. Sumptuous pair of pendant earrings with three dazzling acrylic stones with a cracked finish. Stainless steel hooks. Nickel tested. Length: 6.7 x 2.1 cm.